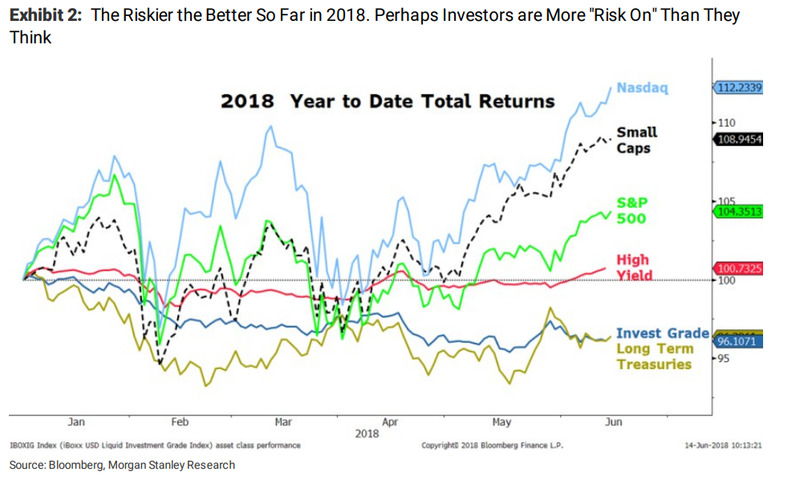 Investors are taking on more risk in the stock market than is obvious, said Michael Wilson, the chief equity strategist at Morgan Stanley. The outperformance gap of tech companies over long-term Treasurys and the resilience of the most heavily shorted stocks are among the reasons for this view. It’s too early to turn defensive, Wilson said. But a risk-on asset allocation could be out of place by the end of the year. Michael Wilson, Morgan Stanley’s chief equity strategist, is among those not counting on the stock market to have another stellar year. 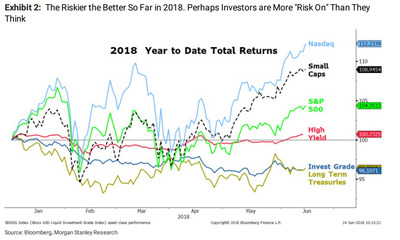 Even with the benchmark S&P 500 index up about 3.7% this year, trailing the 19% performance of last year, Wilson sees proof that investors are taking on more risk than is obvious. The first is simply a ranking of the performance of various corners of the market this year. After all, if investors sense it would pay to be more conservative, they’d be shifting their portfolios accordingly. But the Nasdaq Composite, which is dominated by tech stocks, is right at the top of the list Wilson compiled, suggesting investors are unfazed by ballooning valuations and the prospect of an earnings-growth slowdown. Next are small-cap stocks, which are getting a tailwind as larger-cap industrials face the threat of a trade war between the US and its major trading partners. Credit, including long-term Treasurys and investment-grade bonds, are a lot closer to the bottom of the ranking. Wilson said this mirrors Morgan Stanley’s own asset allocation, which prizes small-cap stocks and others that would benefit from a longer economic expansion. “But we think by year end such a ‘risk on’ hierarchy will be misplaced given the more uncertain outlook posed by ‘peaky’ growth rates and ever tightening financial conditions,” Wilson said in a note on Monday. For further evidence that investors are taking on more risk than they realise, Wilson pointed to the strong performance of the stocks traders are betting against the most. Again, that list of the most-shorted stocks is dominated by tech. According to data compiled by the financial-analytics firm S3 Partners, Apple is the most heavily shorted S&P 500 stock – and it’s up 12% this year. That’s small potatoes compared to Netflix, the third most-shorted stock, which has gained 104%. Wilson further observed that companies with high-yield debt have also outperformed of late. There are three things to watch for that would show investors are turning away from risk. Two of them may already by happening, Wilson said. Investors are worried about a peaking in the pace of earnings growth, and the 10-year Treasury yield “topped” for this cycle at 3.12%. The third signal is a yield curve inversion, which typically precedes recessions and hasn’t happened yet. To that end, Wilson upgraded the utilities sector to “overweight,” based on his conviction that the 10-year yield has made its high watermark. The sector is preferred as a so-called bond proxy for its dividends, which should look more attractive if Treasury yields stay as low as Morgan Stanley forecasts. Some of the most attractive companies in the sector include American Electric Power, FirstEnergy, and NextEra Energy.